Ever wondered what the collective noun is for various groups of animals, birds or insects? Here are some of the obvious and not so obvious. Background information on the use of collective nouns can be found here. I would like to point out that these terms have not been officially "authenticated". ANTELOPES A HERD of antelopes. A STATE or SWARM of ants. BACTERIA A COLONY of bacteria. Micribiologists call groups of bacteria COLONIES. A culture would consist of many colonies. BARRACUDAS A BATTERY of barracudas. BASS A SHOAL of bass. BATS A COLONY of bats. BEAVERS A COLONY of beavers. A CLUSTER, ERST or NEST of bees. A FLOCK, FLIGHT, or PARCEL of birds. BISON A HERD of bison. BITTERNS A SEDGE of bitterns. Just in case there is anyone else out there who, like me, doesn't know what a Bobolink is I have been reliably informed by Amelia B., that it is a small bird. The male is black and white with a yellow cap on his head and the female is golden brown with brown markings. (their call sounds a little like someone saying the word whippoorwill). Thanks to Eric Pittenger for this additional information. *** Apparently this is not the case. Clarice Olle has been kind enough to point out that the above is in fact incorrect. A bob-o-link (short for Robert of Lincoln) is NOT the same bird as a whippoorwill. Bobolinks and whippoorwills are two different birds. The bobolink is a small-medium size bird dwelling in open fields where it makes its nest on the ground and has one of the most amazing and hysterical songs ever. The whippoorwill is a medium size bird, active at night, with plumage so as that you practically step on them as they rest on the forest floor. An interesting note about the whippoorwill is that they will come to rest in a circle, with their tails all facing in so that they can be protected from danger. Susan Vanderveen also confirms - I respectively submit the information that a Bobolink and Whip-poor-will are not two terms for one bird. They are two very distinct species. A BRACE OR CLASH of bucks. I was looking at your wonderful list of animal collectives for my website (everbosity.wordpress.com) and came across the use of "brace" several times, firstly under birds. A brace is a pair of anything and not specifically related to any animal. A player can score a brace of goals in a football match for example. I wouldn't consider it a collective title. BUDGERIGARS A CHATTER of budgerigars. BULLOCKS A DROVE of bullocks. BUTTERFLIES A SWARM or RABBLE of butterflies. BUZZARDS A WAKE of buzzards. CAMELS A CARAVAN, FLOCK or TRAIN of camels. CARIBOU A HERD of caribou. CATERPILLARS An ARMY of caterpillars. A HERD, DROVE or DRIFT of cattle. "Cattle" refers to both male and female cows. Gwendolyn Cannon suggests that 'Cattle' refers to both male and female cows. You must be joshing me Gwendolyn. There is no such thing as a male cow ! He's either a "Bull" or a "steer/Ox". I'll bet you did that on purpose just to see how many responses you get, didn't you ? Although Donald is, of course, correct, in defence of Gwendolyn I think she was using the term 'cow' colloquially as it is quite difficult to think of a term which covers both sexes (hence the use of the term 'cattle' in the first place. Another term for male cattle is 'bullock'. A bullock is a male domestic bovine animal that has been castrated and is raised for beef. CHICKS A CLUTCH OR CHATTERING of chicks. CHOUGHS A CHATTERING of choughs. COCKROACHES An INTRUSION of cockroaches. COLTS A RAG of colts. COOTS A COVERT or COVER* of coots. CORMORANTS A GULP (SOLITUDE)* OR FLIGHT of cormorants. COWS A HERD of cows. * This term is not widely used these days and is considered archaic by some. "Kine" refers to only female cows (like a dairy herd). "Cattle" refers to both male and female cows. SEE ALSO "CATTLE" above for other terms. ***For your information, a bushel of crabs is what you call it if you are buying crabs to eat. Bushel is the measurement of how many you will buy (i.e. Half a bushel, two bushels). Its like buying meat in pounds at the deli. eaten. I believe a group of live crabs is called a cast. Steve Miller has also pointed out that it is incorrect to apply this label to certain specific species e.g. a bushel of crabs as you could equally have a bushel of corn. A BASK or FLOAT of crocodiles. A HOVER, MUSTER, or PARCEL of crows. Jill Dobbs, Rachael Blomeley and anon. CURS A COWARDICE of curs. A BEVY of roe deer. DOLPHINS A SCHOOL of dolphins. DOTTEREL A TRIP of dotterel. Apparently a Dotterel is a rare plover of upland areas of Eurasia. Thanks to Linwood Lyons for supplying this useful information. Dotterels breed on our beach near Nelson, New Zealand, in the southern summer. They then migrate to Siberia for the northern summer, and so on. They are quite small dainty birds, you would never guess that they have such stamina. A FLIGHT, DULE or DOLE of doves. A PITYING of turtle doves. A RAFT, PADDLING or BUNCH of ducks on water. A TEAM, BRACE, BED, FLIGHT OR FLOCK* of wild ducks in flight. EAGLES A CONVOCATION of eagles. EELS An ARRAY of eels. EMUS A MOB of emus. FERRETS A BUSINESS of ferrets. A SHOAL, DRAFT, NEST, SCHOOL* of fish. A RUN of fish in motion. FLAMINGOES A STAND of flamingoes. A CLOUD, HATCH, BUSINESS* or SWARM of flies. A CLOUD, TROOP, or COMPANY of foxes. A GAGGLE or FLOCK of geese. GERBILS A HORDE of gerbils. A CORPS, TROOP, HERD of giraffes. GNATS A CLOUD OR HORDE of gnats. GNUS An IMPLAUSIBILITY of gnus. GOLDFINCHES A CHARM of goldfinches. GOLDFISH A TROUBLING of goldfish. It's debatable whether or not they have become real collective nouns since then. GRASSHOPPERS A CLOUD of grasshoppers. GREYHOUNDS A LEASH of greyhounds. GUILLEMOTS A BAZAAR of guillemots. GUINEA FOWL A CONFUSION of guinea fowl. A RASP of guinea fowl. GULLS A COLONY of gulls. HAMSTERS A HORDE of hamsters. HARES A HUSK, DOWN or MUTE of hares. A CAST, KETTLE (flying in large numbers) or BOIL (two or more) of hawks. HEDGEHOGS An ARRAY of hedgehogs. HENS A BROOD of hens. HERONS A SCATTERING, SEIGE or SEDGE* of herons. HERRING An ARMY of herring. (South American jungle bird) A DONGLE of hoatzin. HOGS A DRIFT or PARCEL of hogs. HORNETS A NEST of hornets. A FIELD, HERD, REMUDA, SET or STABLE of horses. HYENAS A CACKLE of hyenas. JACKRABBITS A HUSK of jackrabbits. JAYS A PARTY or SCOLD of jays. JELLYFISH A BROOD, SMUCK or SMACK of jellyfish. A KENDLE, KINDLE or LITTER of kittens. LADYBEETLES A LOVELINESS of ladybirds. Sent in by Simon Odell - not authenticated but too nice to omit. Joe Dahl says - I too have heard of the collective noun for ladybirds being a 'loveliness' as heard on a BBC Radio 4 programme a while ago. LAPWINGS A DESERT or DECEIT* of lapwings. LEMURS A TROOP of lemurs. LICE A FLOCK of lice. A PRIDE, FLOCK, SAWT, SOUSE, or TROOP of lions. LOCUSTS A CLOUD, PLAGUE or SWARM of locusts. LOONS A RAFT of loons. Dr. Mulhearn kindly provided some additional information on this subject. "The term is not often usable because they rarely group. On occasion however, for reasons yet unknown, they will meet for short periods, on a lake in groups numbering from a half dozen to a few dozen. They drift around the lake in their raft for a few days until they eventually again go their separate ways." MAGPIES A TITTERING, TIDING, GULP, MURDER or CHARM* of magpies. MALLARDS A SORD or BRACE* of mallards. MARES A STUD of mares. MARTENS A RICHNESS of martens. MEERKATS A MOB of meerkats. MICE A MISCHIEF of mice. MINNOWS A STEAM of minnows. MOLES A LABOUR of moles. MONGOOSES A BUSINESS of mongooses. MOOSE A HERD of moose. MOSQUITOES A SCOURGE of mosquitoes. MULES A BARREN, PACK* or SPAN of mules. NIGHTINGALES A WATCH of nightingales. OTTERS A FAMILY, BEVY or ROMP* of otters. OWLS A PARLIAMENT of owls. A STARE or WISDOM of owls. OXEN A TEAM or YOKE of oxen..
PARROTS A PANDEMONIUM or COMPANY* of parrots. PEACOCKS A MUSTER or OSTENTATION* of peacock. PEEPS A LITTER of peeps. PELICANS A SQUADRON of pelicans. A POD or SCOOP of pelicans. A HEAD, NYE, NEST, , NIDE (BROOD)* or BEVY of pheasants. A FLOCK or FLIGHT of pigeons. I have been advised by Terry West that this can also be a "LOFT" of pigeons. I am, however, a little nervous about this one as I know pigeons' living quarters are called a Loft. You question a 'loft' of pigeons because a loft may be a pigeon's home. Many creatures can be referred to in this way - cf. a dray of squirrels; and I wonder if a cete of badgers is not, at heart, a 'set' of badgers. PONIES A DROVE OR STRING of ponies. PORCUPINES A PRICKLE of porcupines. A HERD, SCHOOL or POD of porpoises. PRAIRIE DOGS A COTERIE of prairie dogs. RABBITS A BURY, COLONY, CIRCLE, NEST, HERD (domestic), LITTER (young) of rabbits. Several people, including Lyle McNair, have submitted this term but it has always been my understanding that 'warren' was the name given to the network of interconnecting rabbit burrows in which rabbits live. Collective nouns are notoriously difficult to authenticate but during research, although I could not find official clarification that warren is an authentic collective noun, I have seen other references to its use so I have decided to include it. Lyle has now sent me some additional information regarding the use of the term "warren" as a collective noun. The "World English Dictionary" (accessible through www.dictionary.com) defines "warren" as "a colony of rabbits" and "colony" in a zoological sense is further defined as "a group of the same type of animal or plant living or growing together, especially in large numbers". RACCOONS A GAZE of raccoons. RATS A COLONY of rats. A PACK or SWARM of rats. RATTLESNAKES A RHUMBA of rattlesnakes. RAVENS An UNKINDNESS of ravens. REINDEER A HERD of reindeer. ROEBUCKS A BEVY of roebucks. ROOKS A BUILDING or ROOKERY of rooks. (a type of plankton found in lakes and rivers) A POD of rotifers. SARDINES A FAMILY of sardines. SASQUATCH A PUNGENT of sasquatch. SEA OTTERS A RAFT of sea otters Donald Cheek. SEAGULLS A FLOCK of seagulls. * It is rare for seahorses to group together so there is no real collective noun but the above is the term sometimes used for a collection of seahorses. Paul Bergeron has also advised that the term for the offspring of seahorses is "fry". * Tom Clarke has commented - "I note that you list harem for seals. A harem usually refers to a group of female seals who have been organized or collected by a single male for breeding purposes." * Leigh-Anne Kolasinski advises that the term "rookery" is normally used for the place where seals give birth rather than as a collective noun. Another term used for on land habitat of seals/sea lions is 'haul-out' but this would not be used as a collective noun. I have noticed that many of the collective nouns featured on the various pages do in fact refer to the habitat rather than groups but these terms are notoriously difficult to authenticate; even the most prestigious dictionaries do not feature them, presumably for that reason. I am led to believe, however, that the The Oxford Dictionary and Thesaurus (ed. Maurice Waite, 2007) shows this term as being a collective noun. SHARKS A SHIVER of sharks. SKUNKS A SURFEIT of skunks. SKYLARKS An ASCENSION of skylarks. SNAKES A DEN, BED, PIT or SLITHER of snakes. A NEST or KNOT of snakes. SPARROWS A HOST of sparrows. SQUIRRELS A DRAY* or SCURRY* of squirrels. "I believe the term "dray" of squirrels is incorrect, since a dray is the name for a squirrel's sleeping quarters, and most of the time there is only one squirrel inhabiting a dray. At most, a dray would house a litter (2-4 babies) plus mom but that is only twice a year. Squirrels do use a buddy system when they can and pair or triple up for safety ( this is not their mates but often siblings or two weaker members of a greater community will buddy for strength in numbers). Any way you look at it, a dray doesn't hold much of a group." I did some research on the subject and the term "dray" some appear to be the popular choice, however, like Laurel, experts say that as squirrels are fairly solitary creatures there is probably no need for a collective noun. I doubt if the lady who sent in the photos featured on the following site would agree! STARLINGS A MURMATION of starlings. STINGRAYS A FEVER of stingrays. STORKS A MUSTERING of storks. A GAME, BANK, TEAM, HERD or BEVY* of swans. A WEDGE of swans in the air. TADPOLES A CLOUD of tadpoles. TEAL A SPRING of teal. TERMITES A BROOD, COLONY, NEST OR SWARM of termites. THRUSHES A MUTATION of thrushes. TIGERS An AMBUSH or STREAK* of tigers. TORTOISES A CREEP of tortoises. TROUT A HOVER of trout. TURKEYS A RAFTER or GANG* of turkeys. A CLUTCH * of turkeys. * I think this term usually refers to the eggs e.g. "a clutch of eggs"
TURTLE DOVES A PITYING or DULE of turtle doves. TURTLES A BALE, DOLE or NEST* of turtles. Danielle W. (via Jane Yolen's short story "The Boy Who Drew Unicorns"
The term 'brood' has been applied to vipers, most notably by Jesus (Matthew 12:34, Matthew 23:33), but also by John the Baptist (Matthew 3:7, Luke 3:7). Whether or not this stands up to scrutiny and qualifies as a precedent (given that neither of the two were scientists, nor were the translators of the Bible) is, of course, up to you. VULTURES A COMMITTEE of vultures. WALRUSES A HERD or POD of walruses. WASPS A PLADGE of wasps. WEASELS A **BOOGLE, GANG, *CONFUSION or PACK of weasels. A BUNCH, TRIP or PLUMP of wildfowl. WOMBATS A WISDOM of wombats. WOODCOCKS A FALL of woodcocks. WOODPECKERS A DESCENT of woodpeckers. WORMS A CLEW of worms. Are you aware that there is a book which lists "nouns of multitude?" 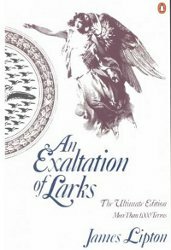 It's title is "An Exaltation of Larks." With this in mind I thought you maybe interested to hear that there is a book available entitled "Flocks, Herds, Litters and Schools" by Jim McMullan in which he tries to find the origins of some of the more popular collective nouns in a fun and interactive manner.